Barbados cherry, which is also known as acerola in Central America, has the highest vitamin C content among all the cultivated fruits. This fruit contains 65 times more vitamin C than an orange. Barbados cherry is a native of West Indies or Central America. It has become naturalized in Cuba, Jamaica and Puerto Rico after cultivation, and is commonly grown in dooryards in the Bahamas and Bermuda, and to some extent in Central and South America. A large, bushy shrub or small tree attaining up to 6 m high; branches more or less erect or spreading and drooping, minutely hairy, and a short trunk,10cm in diameter. Leaves elliptic, oblong, obovate, or narrowly oblanceolate, somewhat wavy, 2-7 cm long, 1-4 cm, obtuse or rounded at the apex, acute or cuneate at the base; bearing white, silky, irritating hairs when very young; hairless, dark green, and glossy when mature. Flowers sessile borne on short-peduncled cymes; sepals 5, pink or lavender, spoon-shaped and fringed. Fruits round to oblate, cherry-like but with 3 lobes, bright red (rarely yellow-orange) with thin skin, easily bruised. The pulp is juicy, acid to sub-acid occasionally nearly sweet, with a delicate flavor and apple notes. The fruit is very high in Vitamin C, up to 4,000 mg per 100 g fresh weight, but typically around 1,500 mg C. Green fruits have twice the Vitamin C level of mature fruits. Seeds 3, small, rounded, each having 2 large and 1 small fluted wings, thus forming what are generally conceived to be 3 triangular, yellowish, leathery-coated, corrugated inedible “stones”. The fruit is edible and widely consumed by local people in native area. It is cultivated elsewhere for its high vitamin C content. It is commonly used in parts of South America to flavor ice creams, drinks, and cocktails. The fruits are used in many commercial vitamins and nutritional products, mainly for their vitamin C content. 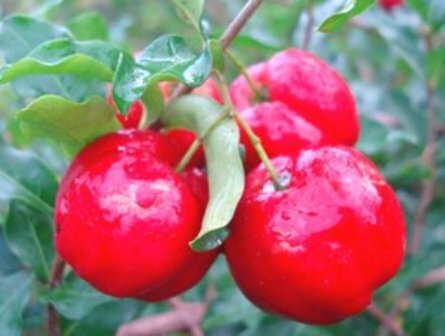 Acerola juice is as common and popular in Brazil as orange juice is in North America. In Brazil, a handful of fresh fruit is eaten as a natural remedy for fever and dysentery. It is also used there as an anti-inflammatory, astringent, stimulant for the liver and renal systems, diuretic, and to support heart function as well as to heal wounds. 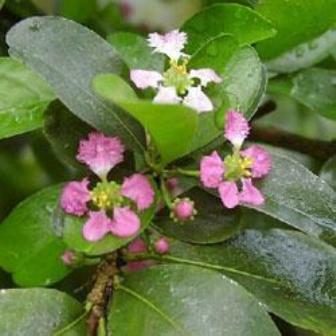 It is employed as a nutritive aid for anemia, diabetes, high cholesterol levels, liver problems, rheumatism, tuberculosis, and during convalescence. The plant is propagated by seeds. The germination is usually low. 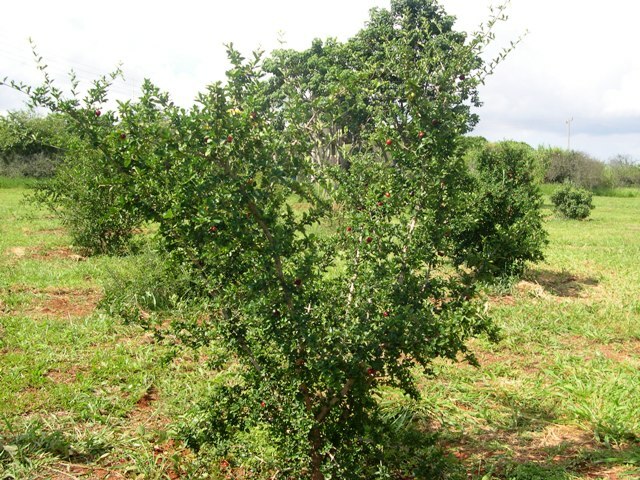 Plantings of Barbados cherry are increasing worldwide, with Brazil leading the way. The increased plantings are a direct result of increased use of this fruit for a natural source of Vitamin C for nutritional supplements. The following cultivars are offered by nurseries in USA. B-17: A common variety. High in vitamin C and subacid to acid. Dwarf: A low-growing cultivar, to about 2 ft. tall. Grows well in a hanging basket. Can take colder weather than others, to 22° F.
Florida Sweet: A common California variety. Fruit large, 1-1/4 inches in diameter. Skin thick. Flesh very juicy, flavor apple like, semisweet. Vitamin C content about 1,500 to 2,000 mg. per 100 g.
Manoa Sweet: Orange-red fruit of the sweet type. Tree upright, spreading, very productive. Some other named varieties include: Beaumont, Haley, Hawaiian Queen, Maunawili, Red Jumbo, Rehnborg and Tropical Ruby. Varieties other than B-17 and Florida Sweet are not often encountered in Southern California.